At a dive, either the bartender won't hestitate to get chummy or they'll ice you out until you've spent a couple of years ordering the same bottled beer from them. This Alphabet City spot tends to skew younger in terms of clientele and staff, meaning all the skinny kids will be talking to one another. It also helps that the place is so small. 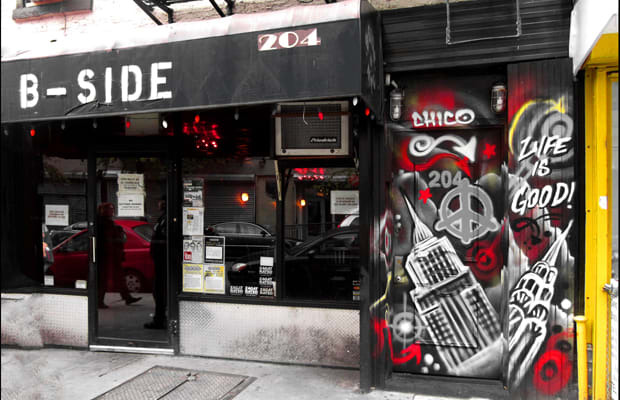 Get friendly at the bar (either that or you're pressed against a wall, practically), peruse the jukebox (with a name like B-Side, it'd be embarrassing if they didn't deliver, so they do), grab one shot and one beer, and make like you never drink alone.